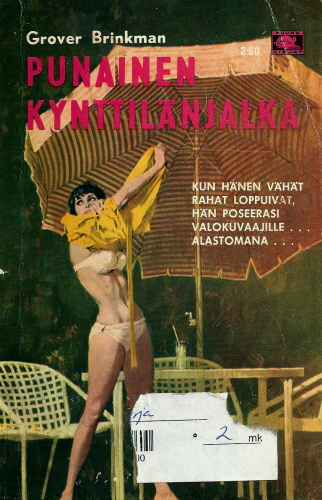 When I was doing my ground-breaking first book, Pulpografia, the encyclopedia of over 300 American pulp and paperback crime writers published in Finland, I noticed that some of the books that came out here weren't always published in the US. The first one I could identify was Bruce Cassiday's The Heister (Vain viisi tuntia in Finnish), a solid cop novel that Cassiday and his agent couldn't sell to American publishers in the mid-sixties, so it landed only here (and other Nordic countries, if I remember correctly). It's not a bad book, someone like Gary Lovisi should reissue it. Some other books that I had difficulties with were four PI novels by one Grover Brinkman. They featured a half-Indian private eye Colt Youngblood (dig that name, will you! ), with broads and bullets. Nothing remarkable here, it's no wonder the books didn't sell in the US. But still interesting to know about them. Going through some old files I spotted a Contemporary Authors entry for Brinkman I've received from someone (as usual, I believe it was Denny Lien). It mentions "a four-part detective novel series published in Scandinavia". Brinkman also had an erratic, but long career in pulps and other fictionmags. See here for more details. 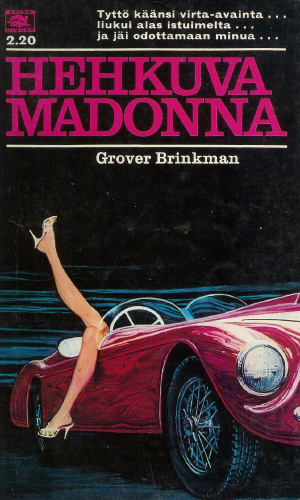 Attached are two covers of Brinkman's novels, the other two are Chubasco! (Hirmumyrsky in Finnish) and Thunderbird (Ukkoslinnut in Finnish). Belleville College of Business. Religion: Methodist. Memberships: Lions Club. Career: Okawville Times, Okawville, IL, editor and publisher, 1925-47; free-lance writer and photographer, 1947--. * Night of the Blood Moon, Independence Press (Independence, Mo. ), 1976. Also editor of This Is Washington County, 1968, and Grover Brinkman's Southern Illinois, 1976. Also author of a four-part detective novel series published in Scandinavia. Contributor to more than two hundred magazines and newspapers, including Life. Editor of Back Home in Illinois, a regional magazine. Brinkman comments: "I work with my wife as a writing-photographic team; I sold my first piece of fiction to Grit at the age of sixteen; since then have been selling on the regional, national, and international level. I have more than a hundred thousand photographic negatives on file, the work of forty years behind the camera. In other words, I'm a working freelance and we make a living at it. I write fiction `just for fun.' "